I’m fortunate to have lived a life, thus far, having never been truly hungry — save for a few lean days in my early twenties where I was earning just enough to keep me rich in Ichiban noodles. My earliest recollection that some people, kids in particular, didn’t have enough to eat was in my Grade 6 production of Oliver Twist. Details are fuzzy, but I distinctly remember the mealtime scene where all the hungry orphans sang a rousing chorus of Food, glorious food. We don’t need to be without food for it to be a focus of our lives. If we aren’t eating a meal or thinking about the next one, we’re sitting on the sofa snacking while watching TV shows about food on channels solely devoted to food. We all know the ‘foodies’ who plan vacations entirely around food: countries selected, cities filtered and Michelin-star restaurant booked months in advance. 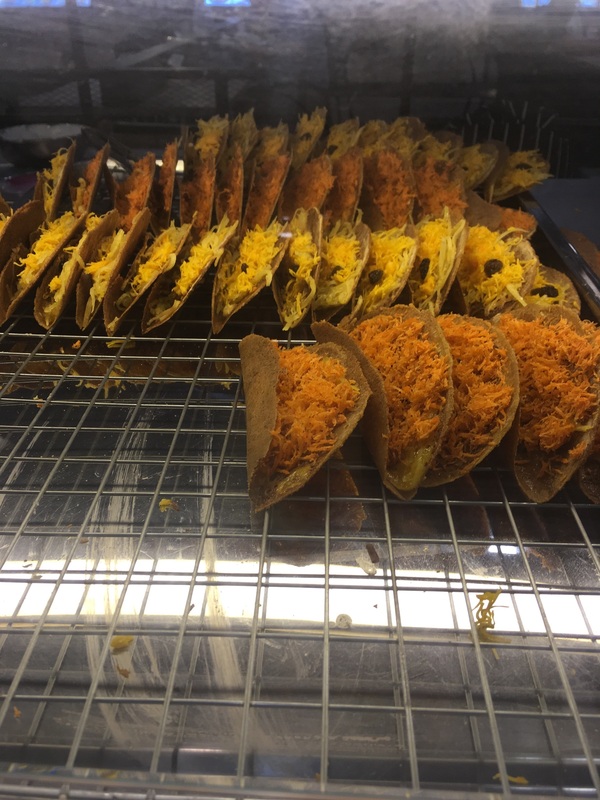 What the city may lack in culinary sophistication, it more than makes up for in street food availability, variety, taste and price. As someone from the west, I had a different, sanitized understanding of street food. Back home in Calgary, our attempt at street food translates to cube vans pimped out into traveling kitchens that provide gourmet, easy-to-eat grub covering the gamut of cultures and cuisine. I had to temper my enthusiasm for street food prior to our trip because I read something about Bangkok cracking down on street food, which is expected to result in fewer vendors. No dice — they’re EVERYWHERE — several dozen in the two-block walk to our closest grocery store — an equal number more in the next two blocks to the closest skytrain station. From what we’ve observed, no one cooks for themselves. Kitchens here have hotplates and oversized, virtually unused toaster ovens. In fact, we haven’t cooked anything since we’ve been here. Seemingly, the only people cooking are these curb-side entrepreneurs. No fancy trucks needed. I’m continually amazed what they can whip up in space no bigger than a card table. Some vendor stations are really gritty, yet they seem the most popular. Many are tucked away under tattered canopies or wedged between vacant buildings. Others are set up in an endless row in front of shops along the street. Did your haircut leave you hungry? Step outside and get lunch. Famished after your massage? Dinner is just steps away. I’ve wondered how so many vendors here can make a go of it? Upon closer inspection, they’ve set themselves apart from their immediate neighbours by providing something a bit different. Most of it is cooked onsite and packaged for the hungry masses to take home and enjoy in short order. Full disclosure: Although we have sampled the delicacies from many vendors, we’ve been a tad cautious to date. Despite taking Dukoral, and being up-to-date on our Hep vaccines (highly recommended!! ), we are steering clear of leafy or unpeeled veg and fruit. 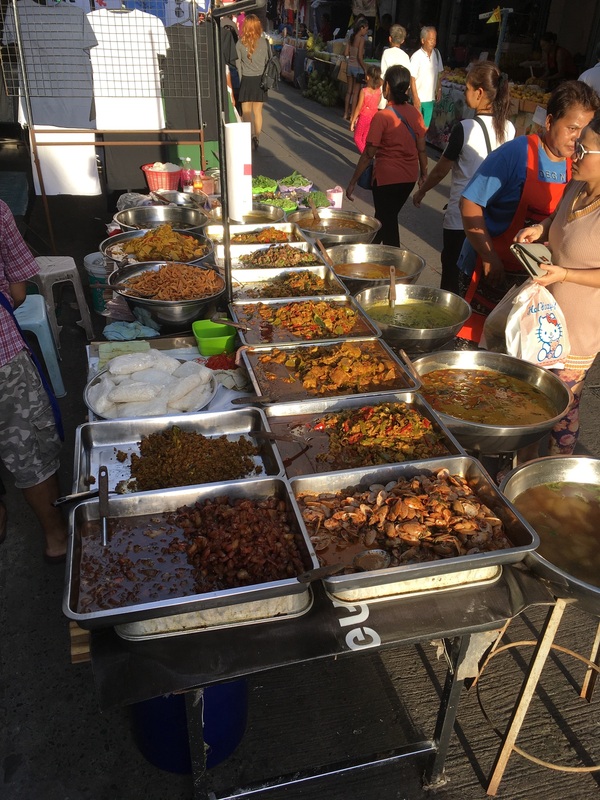 For the most part, I can’t make heads nor tails of a lot of what is being grilled or fried before our very eyes as we weave our way through the crowded main roads and smaller side streets. And I literally mean heads and tails and every juicy bit in between – be it pig, chicken, cow and the occasional insect. 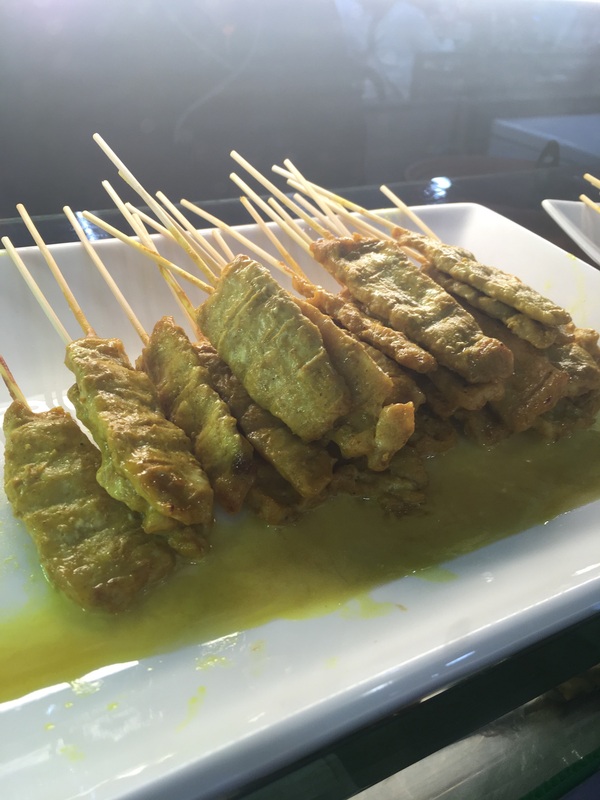 We have our (safe) favourites: small satay chicken skewers; barbeque pork skewers; dumplings, which I believe (hope) are filled with pork; steamed buns with a variety of fillings both savoury and sweet; and a variety of noodle soups. We were lured in by the great smells and we keep returning because they taste incredible. So far no tummy troubles. As the weeks progress, I’m certain our courage to try the unfamiliar will grow. As for the price, you can’t beat it. You’d be hard pressed to spend more than CAD$6 on a meal for two on the street. For the budget conscious, money saved on meals, is more money for beer (also cheap) and wine (far from cheap). 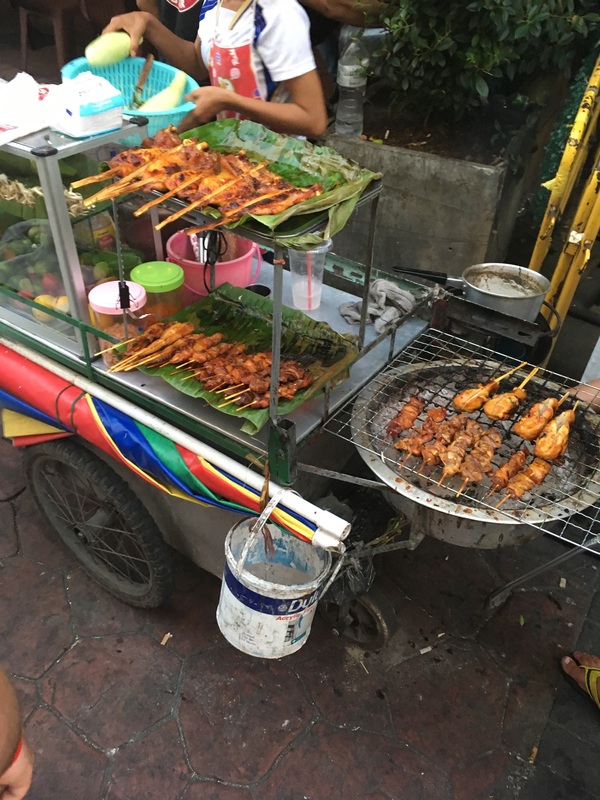 We’ll be exploring more street food in Southeast Asia over the coming months and we’ll try the occasional restaurant for some more refined dishes, but we’re good right now scouring the streets for our next meal — it’s not nearly as bad as it sounds. 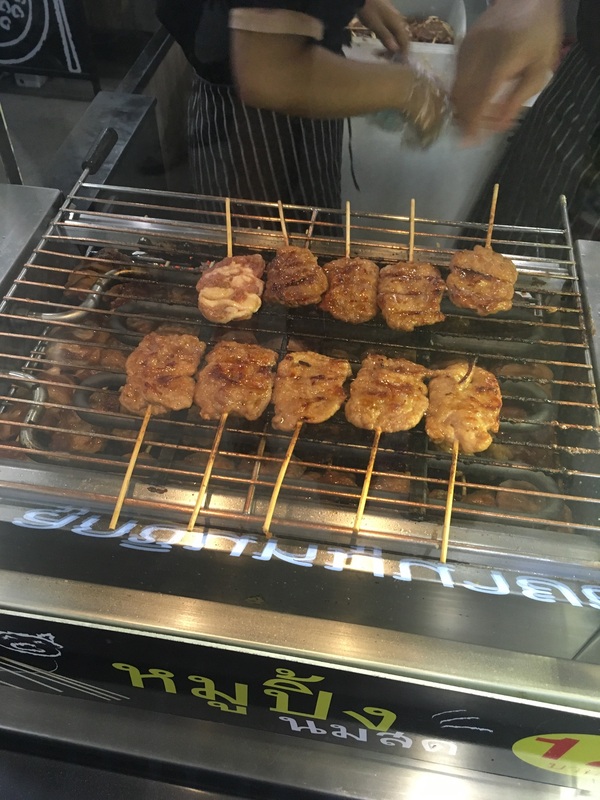 Now if only poor, little Oliver Twist had been in Bangkok – food, glorious (street) food. Well written! You Would Have made a great Oliver!!! Wow – Chris can write! Thanks for sharing… I’m eagerly anticipating your future posts! You definitely need to search out some of the better restaurants. I had a few fabulous meals over the few days in was in Bangkok. I love the lettuce wrapped thingeys, I’m sure these will be easy to find with my incredible description. They are an appetizer sort of thing. Delicious. I’m such a good foodie – not! Thank you Chris for your updates as I have never been to Thailand and it is great fun to visit another country through someone else’s eyes. Hugs to you and Frank.